Long Valley Yurts have teamed up with the wonderful folk at Knotlow Farm campsite to bring you a glamping holiday with a difference. The magic combination of our beautiful yurts, Scandinavian wood-fired hot tubs and stunning scenery is truly hard to resist! What better way is there to spend an evening than soaking away the hustle and bustle of everyday life, watching the steam gently swirling and rising up into the night air? Sit back inside your yurt with a mug of hot chocolate, enjoy the warmth of the wood burning stove and watch the solar fairy lights twinkling against the canvas as you drift off to sleep. Waking up the next morning to the sound of birdsong and the prospect of exciting new adventures ahead is all part of the Long Valley Yurts holiday experience. 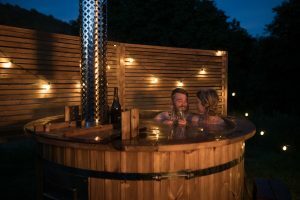 Come and experience ‘living in the round’ for yourselves amongst the splendour of the rolling hills and dales of the Peak District National Park and enjoy a unique holiday that you will never forget. 4 yurts available to book from March–November.